Arthritis is a disease caused by the swelling or inflammation of the lining of our joints known as 'Synovium'. This Synovium helps to protect our joints from the impacts endured during running as well as aiding the joint to move freely. In the last year, over 8.57 million people in the UK have sought treatment for this condition, however this can often be costly and involve taking pharmaceutical drugs including steroids which many people try to avoid wherever possible. One of the most powerful natural alternatives is apple cider vinegar, a natural fermented liquid packed full of healthy bacteria and living enzymes. But first lets look at the common types of arthritis. Stiff, hard to move joints. Pain and swelling around the joint areas. Inability to fully straighten some limbs. Pain and swelling around the big toe. Red and shiny skin around the area. Stiff, painful joints and swelling. Flu like symptoms including sweating and fevers. Mineral content - Apple cider vinegar contains many essential trace minerals including calcium, magnesium, potassium and phosphorus. Being deficient in these minerals can worsen the symptoms of arthritis. The calcium and potassium found in ACV both plays key roles in the body by strengthening bones and reducing stiffness. Restore our natural pH - The pH scale is how we measure the alkalinity or acidity of a substance. It ranges from 0 - 14 with neutral found at pH 7. Much of the pain associated with arthritis is due to build up of Uric acid crystals that form when our body is in an acidic state. Drinking apple cider vinegar every morning will help to restore your body to the optimal range of 7.35 - 7.45. Natural source of Pectin - Pectin is a substance often used to help set jellies and jams, but this natural substance goes a whole lot further than making perfect preserves. The pectin found in apple cider vinegar helps to remove toxins from our body that would otherwise become stored in connective tissues. 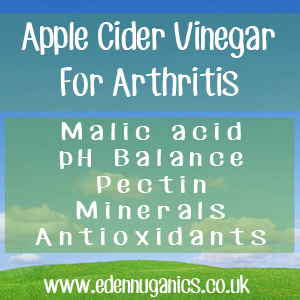 Acetic and Malic acids - Apple cider vinegar contains these two beneficial acids that help to remove the build-up of uric crystal on joints, a problem commonly associated with gout. In addition, both these substances play a role in balancing our bodies pH levels. What can be mixed with apple cider vinegar? Cherry juice - Cherry juice is a very popular choice when it comes to the natural treatment of arthritis. These sweet tasting fruits offer our bodies a powerful anti-inflammatory action as well as powerful antioxidant support. Turmeric - The active ingredient found in Turmeric is known as Curcumin. Many official studies have been carried out on this powerful substance. There is now firm evidence that Curcumin can be more effective at alleviating the symptoms of arthritis than many pharmaceutical drugs. Lemon juice - As mentioned before, alkalising your body is one of the first steps to take when naturally treating arthritis and there is no better way than drinking fresh lemon juice mixed with water. Many cheap bottles of apple cider vinegar will have been pasteurized, a process that involves heating the liquid to extremely high temperatures before filtering. Sadly, this process removes the living enzymes known as 'the mother' that are responsible for many of the unique health benefits ACV has to offer.